When selecting food for my family, it’s important for me to know where the food is coming from. If food isn’t labeled properly, I simply won’t buy it. When choosing chicken, I look for the Raised by a Canadian Farmer logo because I know it was raised according to strict safety & quality guidelines. What exactly does that mean? A few weeks ago I had the opportunity to meet with a Canadian chicken farmer on his farm in Ontario. We saw the way they care for the chickens making sure that they are well taken care of with clean barns, plenty of food & water plus lots of space to roam around. They are many safety rules & controls in place to make sure that they are giving quality products to their consumers. 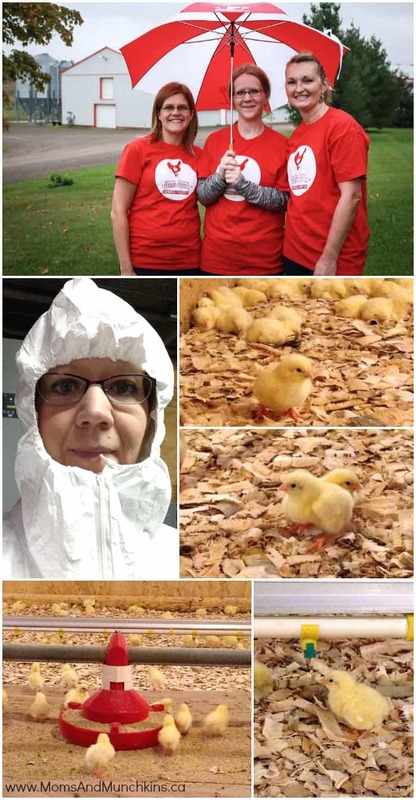 Wearing my special white safety suit (to protect the chickens from any germs we could pass to them), we had the opportunity to meet 24,000 baby chicks that had just arrived on the farm the day prior to our visit. The farmer showed us the controls in the barns and how they monitor the environment for the chickens. The chickens have access to fresh food & water 24/7. The temperature in the barn is closely monitored to keep the chickens warm & comfortable. On the particular farm we visited, the chickens will be there for about 35 days. Canadian chicken farmers take their job very seriously and are monitored to make sure they follow the strict guidelines set out for them. The end result (quality product for consumers) is always on their mind. Chicken farming is often a family-run business. Did you know that there are approximately 1100 family-operated chicken farms in Ontario? By purchasing chicken Raised by a Canadian Farmer, I know that I’m feeding my family a quality product. We eat chicken several times a week in all sorts of meals like burgers, stir fry, meatloaf, over salad, in casseroles & more! 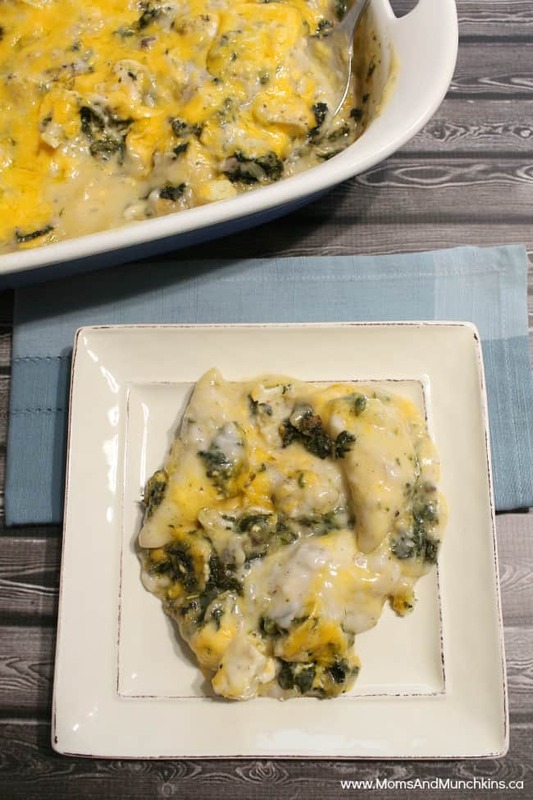 The latest casserole we tried was inspired by the Cheesy Spinach & Chicken Pierogi Casserole on the Chicken Farmers of Canada website. I made a few changes with the sauce (I used a mushroom sauce instead of a tomato sauce) and the spices. I’ve made it twice now and everyone really enjoyed it. Before pouring the mushroom soup over the casserole, I mix it with the water so that it pours more evenly. Prepare a large baking pan (16 x 12 inches) by spraying with cooking spray. Dice the onions and cut the chicken breast into bite-size pieces. Add chicken & onions to the skillet and cook through and until lightly browned. In a medium bowl, mix mushroom soup with water and stir well to mix. Pour ⅓ of the mushroom & water mixture over bottom of baking pan. Top with the frozen pierogies arranging them flat side down. 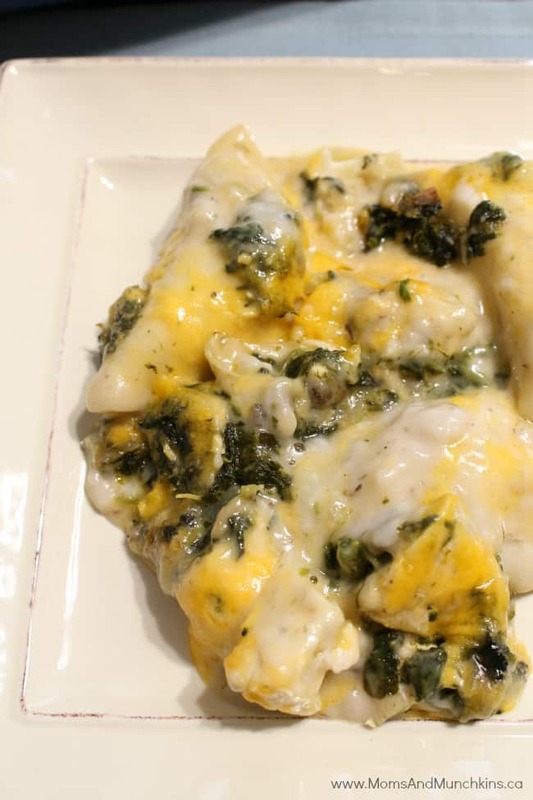 Spread the package of defrosted spinach evenly over top of pierogies. It isn’t necessary to wring the spinach out. 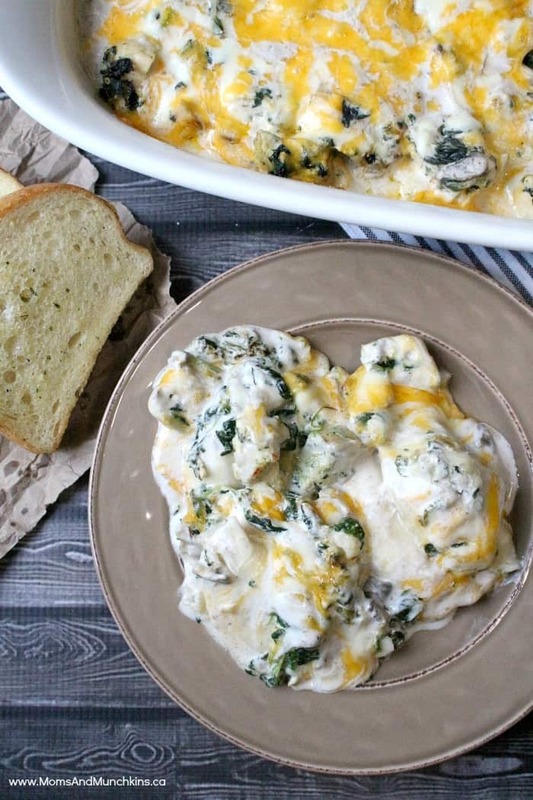 Sprinkle half the cheese over the casserole. Sprinkle chicken and onion mixture evenly over. Pour remaining mushroom soup over top of casserole. Finish by sprinkling remaining cheese over top. Bake uncovered in preheated oven for 30-40 minutes or until heated through. 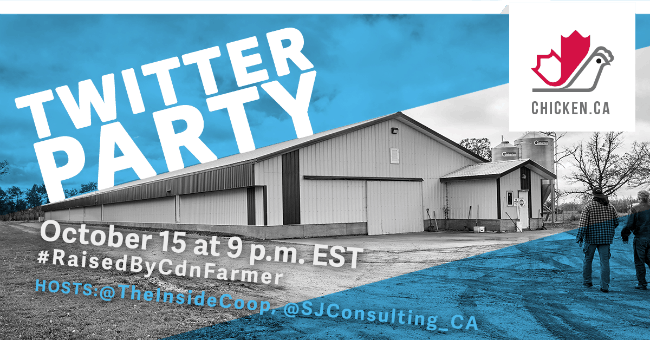 Join us on Thursday, October 15, 2015 at 9pm EST for the #RaisedbyCdnFarmer Twitter Party! We have some great prizes to give away – prizing open to Canadians only. RSVP below by adding your Twitter handle in the Name field and your Twitter link in the URL field. You’ll find the official rules here. Happy to see you and Jennifer there. I was impressed with th cleanliness of the barn and it was so spacious. Your recipe sounds great! We love pierogi, but have never had them quite like this. We will have to give this a try!